The largest floral festival in the Southwest, Dallas Blooms has been a tradition for more than 30 years, and this year's theme plays homage to the beloved state: Dallas Blooms: Deep in the Hearts of Texans. Presented by Bank of America, the floral festival features more than 500,000 spring-blooming bulbs along with life-size Texas-themed topiaries, entertainment, food and special activities celebrating the state. 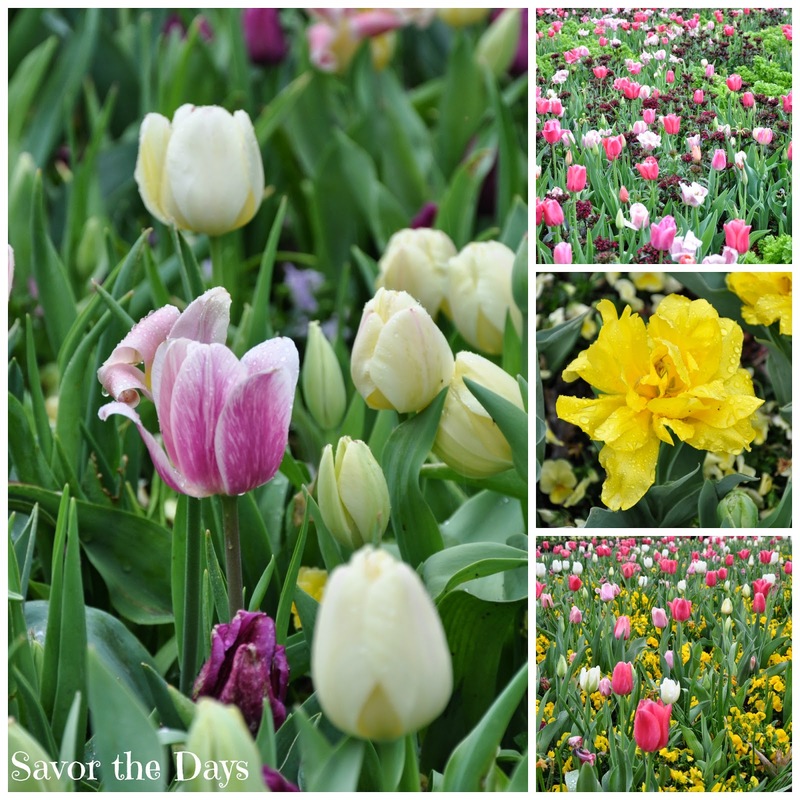 Dallas Blooms includes tulips, daffodils, Dutch Iris and hyacinths, pansies, violas and thousands of other springtime annuals and perennials that bloom throughout the entire festival, so the garden changes all the time. The finale of this celebration is the mass flowering of the garden's collection of 3,000 azaleas and 150+ cherry trees that bloom normally at the end of April. Gracing the garden are life-size topiaries featuring the great symbols of Texas including two longhorns, two horses and the Texas Star-the perfect backdrops for photos and videos. I love the Texas-themed displays so much! They are beautiful and beam with Texas pride. There are plenty of activities for everyone during the festival including picnics and strolls through the garden, and plenty of gorgeous backdrops for photos and videos. A favorite tradition during Blooms is the Spring Tea held at the Restaurant DeGolyer by Gil's Elegant Catering. Seatings are available at 11 a.m. and 2 p.m. daily in the DeGolyer Tea Room. The price ranges from $47 to $57 per person. Reservations are required and can be made by calling 214.515.6511 or online. The seated tea is for adults and children ages 13 years and older. We enjoyed visiting the redesigned Lay Family Garden, one of the first large gardens originally named the Lay Ornamental Garden. It was given as a gift from Mimi Lay Hodges in honor of her late husband, Herman Lay. Renamed and reinterpreted, the Lay Family Garden preserves original iconic elements such as the waterwalls fountain and features a larger pond, a new 12-foot grotto and waterfall, and beautiful new horticultural accents. My kids just thought it was so cool that we could walk BEHIND this waterfall! We spent a LONG time at this waterfall. On the wall and ceiling of the walkway we found geodes and fossils embedded with the other stones. So cool! March 9 and 10, 10 a.m.-2 p.m. This family favorite activity is perfect for young children. Children's activities include face painting, petting zoo, nature art and Kindermusik. -Western-style photo opportunities around a Chuck Wagon, pulled by two horse topiaries located at Café on the Green. -Themed menus at Café on the Green feature classic and new Texas cuisine. -Varied "Texas" musical acts -live - Country/western, "vintage" Texas swing, Spanish style guitar, banjo music. Check website for schedules. Open daily, 9 a.m.-5 p.m. at the north end of the Arboretum. This is really a full day adventure all its own. Check out this post about one of our many visits to the Rory Meyers Children's Adventure Garden. This 8-acre scientific children's garden is where science and fun become one. There are 150 interactive exhibits, many of which include technology, where guests can learn about pollination, habitats, photosynthesis, electricity and more. Special daily activities take place throughout the garden as well as in the 9, 100-square-foot Exploration Center that houses the iconic OmniGlobe, plant labs, CSI-inspired mysteries and 3-D Mini-Theater. The Dallas Arboretum and Botanical Garden is located on the southeastern shore of White Rock Lake at 8525 Garland Road, Dallas, Texas 75218. The Arboretum is open daily from 9 a.m.-5 p.m. General admission is $15 for adults, $12 for seniors 65 and older, $10 for children 3-12 and free for Arboretum members and children two and under. There is an additional cost of $3 per person for entrance into the Rory Meyers Children's Adventure Garden. On-site parking is $15 or $8, if purchased in advance online. For more information, please visit the Dallas Arboretum website.